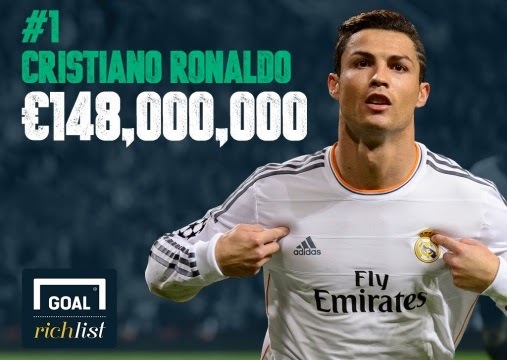 The World Footballer of the Year held off rival Lionel Messi in the 2014 Goal Rich List with an estimated wealth of €148million. Retired footballer David Beckham was the 2013 Goal Rich List winner but since he’s retired from football, he’s no longer eligible to be put in the list. 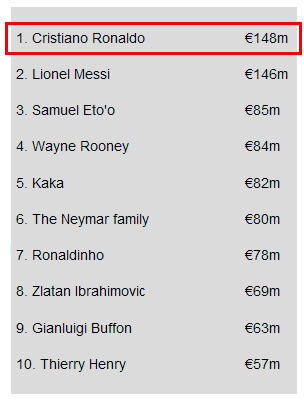 Messi comes second with an estimated net worth of €146million followed by Eto’o with €85million then Wayne Rooney with €84million, and Kaka rounds off the top 5 with €82million.